The Style component in Copernica is fully equipped for creating and managing your own style with style sheets and XSLT files. With CSS you set up rules to define different displaying of HTML elements. Using CSS you can for example state that all paragraphs should have a letter size of 13 pixels. Webforms, surveys and feeds come with a standard style sheet that you can edit as much as you like. They're equipped with /* clear commentary */, so that you can get started right away. Web forms, feeds and surveys always have a default style sheet. If you wish to modify their rules, or create your own style sheet, you can do so under Style. The default style sheets come with lots of comments that will help you modifying it. Note that a stylesheet is not linked to a web form, but to the web page or template whereon you have published it. You can link a style sheet to the page, document or template through its context menu. The same applies to stylesheets for surveys and feeds. To use a stylesheet with your document or template, find the option Set style... in the template or document menu. Once you have linked a style sheet, an additional tab Style is added above the document or template. From here you can instantly edit its rules. Note that the changes apply to all publications that use this style sheet. Because some important email clients can't (or just refuse to) handle CSS styling very well, Copernica converts certain elements to inline CSS when your email is sent, so that your email still looks good. Choose to maintain the style blocks to leave the style blocks in the header or external style sheet in tact. No conversion to inline attributes will take place. Choose 'replace style blocks to style= attributes' to make the document or template suitable for email clients. Choose the third option to keep the block styles, and also convert them to inline attributes. Once you have linked the stylesheet to the document or template, an exta tab [style] will show up above the document. From here you can quickly edit its content. Web forms, surveys and content feeds are built upon XML. The XML file contains the data, and describes what kind of data it is. 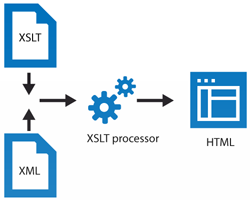 The XSLT (Extensible Stylesheet Language Transformations) is then used to transform the data from the XML to the mark-up language readable for the internet browser: HTML. So, what can you do with XSLT? The publish date of an article should not appear in the HTML document. The author of the article must appear below the article. As mentioned earlier, a web form starts with plain information in XML format. The XML code below represents a web form, and contains information about its fields, label texts and the unique ID of the web form. Very interesting, all that plain information, but unless it's converted to HTML, it is useless to an internet browser or email client. And that's where XSLT comes in. In the XSLT file you define how the plain XML should be given to the browser. The XSLT code below puts the label from the XML in a div with a CSS class. Whenever the field is required, an asterisk is placed behind the field. The software adds a default XSLT to all content feeds, surveys and web forms. Therefore making your own XSLT is not required to publish content with the application. But you are of course free to do so, or to adjust the default XSLT to fit your own needs. Creating a new XSLT file is fairly simple. Go to the Style component. All functions related to creating and managing XSLT files are found in the XSLT menu in the top-left corner. When creating a new XSLT, you can choose to 'Fill the new XSLT with default code'. Once you have created your own XSLT it can easily be linked to the publication where you have created the XSLT for. This is done by adding the xslt= parameter to the tag to publish the webform, survey or web feed.